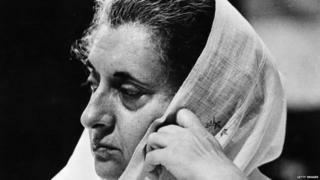 It is exactly 40 years since a state of emergency was imposed in India by the then prime minister Indira Gandhi. The period was marked by massive media censorship, restrictions on civil rights and a forced mass sterilisation campaign. But today, Indian media feel a repeat of the emergency is unlikely due to a "stronger" press and a lively social media environment. On Thursday, papers and commentators are marking 40 years of the emergency which was imposed for a 21-month period from June 1975 to March 1977. In a series of tweets, Prime Minister Narendra Modi called for upholding "democratic ideals" in the country. Papers feel attempts to muzzle the press in today's times are difficult. "Social media and round-the-clock news channels along with an active civil society and judiciary can make it difficult for any such move to be even planned in a clandestine manner… Even if some might hanker for an iron hand at the helm, authoritarianism has limited appeal today, and we are certain that it will stay that way," the Hindustan Times says in an editorial. The Times of India echoes similar sentiments. "The media today is far more diverse than before, which offers a safeguard against centripetal forces," it says. Noted historian Ramachandra Guha also feels that chances of a repeat of the emergency are "slim". "Can India undergo another emergency? The chances are slim, in part because - as prime minister and law minister of the Janata government, respectively - Morarji Desai and Shanti Bhushan undid the emergency-era amendments to the constitution centralising powers in the prime minister, and in part because it is far harder now to suppress the media - especially social media," he writes in The Indian Express. However, commentators warn of the dangers of a personality cult being built around leaders. Mr Guha says a "nationwide cult of personality" is "steadily being built around the prime minister". "In this respect, if in no other, the Emergency is with us yet," he adds. Gopal Krishna Gandhi, who is a grandson of Mahatma Gandhi, urges the media and civil society to encourage freedom of thought. "What we have to be wary of is… the robotisation of our minds into a 'yogic' acceptance of one drill - majoritarianism," he writes in The Hindu. Meanwhile, veteran journalist Kuldip Nayar expresses concern over today's "conformist press". "Though the constitution has been amended to ensure that its basic structure is not tinkered with, it is still easy to subvert institutions by having loyalists in place. The media is stronger today but business houses owning them can be managed. The threat to judicial independence is all too obvious," he writes in The Tribune.